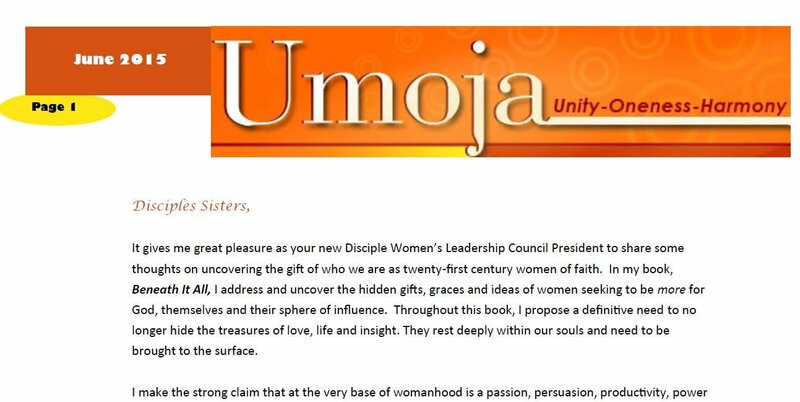 It gives me great pleasure as your new Disciple Women’s Leadership Council President to share some thoughts on uncovering the gift of who we are as twenty-first century women of faith. In my book, Beneath It All, I address and uncover the hidden gifts, graces and ideas of women seeking to be more for God, themselves and their sphere of influence. Throughout this book, I propose a definitive need to no longer hide the treasures of love, life and insight. They rest deeply within our souls and need to be brought to the surface. I make the strong claim that at the very base of womanhood is a passion, persuasion, productivity, power and positive return on any investment concerning us. There is no shortage of potential. (Can I get a witness?) Yes, there are those reading this passage, thinking, “I am doing the very best I can or I have already given my all.” This short excerpt is never to insinuate you aren’t or haven’t. It’s written because, “I believe that there is such a vastness to us, that when we have given what we consider our all-there is still more to be retrieved. This “more” is what Maya Angelou calls , “A Phenomenal Woman.” When a woman enters the room you get more than you asked for…more knowledge…more resources… more solutions…more blessings and of course, more favor. Sisters, we have so much to give, and our capacity for increase and expansion is right here and now. (Can you see it?) Sisters it is our time. It is our time to be out on the front lines of our faith, family and this world learning, growing and making room for the now, new and next. As leaders, we are called to stand at the forefront of a hazy reality that threatens to drastically repeat a part of racial history that left a people and a country on edge. Ladies, we must pray, partner, build and exchange ideas in hopes of greater sisterhood, and more powerful relationships. This includes those who will cross lines of ethnicity, socioeconomic backgrounds, and one’s current station in life. There is a dire need for more vulnerability, hospitality, and accompaniment. An accompaniment that offers a kind of friendship that renders complete openness to all of God’s children. It is vulnerability that supersedes this world which strives to keep us on orange alert. This is a hospitality emanating from a God through Jesus Christ, who loves all, and is willing to help us wrestle in our own corner of life and beyond. This way of life produces an authenticity that demands a shift in thinking, feeling, behaving and practice. I believe women could offer “more” insight. We must present a new revelation that invites the church and this current generation into a bigger rendezvous. We must tangle with what it means to live as individuals, in freedom and on purpose, while at the same time loving our neighbor as ourselves. I am suggesting a insurgence of female prophetic voices. This clarion call insists on a radical coming forth and convening that frees us from heartless negativity, futile words and failed attempts at being a whole people of God. To me, we must make way for the opening of the door to a profound and unwavering life of racial reconciliation, and human equality. It’s coming and it is coming soon. Women, we have the power to do this. What about obstacles? Yes, there are many obstacles to this grace I note. There are times, when fear tries to impede our natural progression as women, and the Godly process of achievements. However, such human and Spiritual fear can be overthrown. We must refuse to be controlled by the ill-informed and the chronic injustices that lead to disparities, competition and the lack of thoughtfulness inside and outside of the church. We must never hinder our calls, nor allow the deepest need for change to go unnoticed while keeping us from our goals. Fear can be compared to hiding all that’s good behind closed doors. We can experience fear with the power to steal the goodly treasures, those having been buried underground, beneath the depths of the earth. There is no more time for a debilitating sense of denial, insular insecurity and the dread of a false humility. Know that our full dependency must rest in the hands of God. There must be a strong declaration and decree from us that we will no longer be held hostage by those things that would keep us from giving, receiving and being love(d). The infinite treasures of life are found in love and faith. The courageous blessings of generosity, loyalty and character are incubated within us, so that we may give, receive and be free agents of change, offering authentic benefits of help, joy, peace and prayers to all. We do not have to live under the control of defeat or the pressures of other people’s opinions. I believe that we can truly live, operate and move under the power and influence of the Holy Spirit. We must give ourselves permission to go beneath the surface. Like diamonds in the rough dig up the priceless nuggets of life using and claim the possessions for the now. When doing so, we shall all see a unique difference in our family dynamics, friendships, the church, jobs, hopes and dreams and resounding sound of hope and blessing. Beneath it all, waiting at the base of our souls is a divine treasure, fixed with the blessings and the benefits of the Kingdom of God.